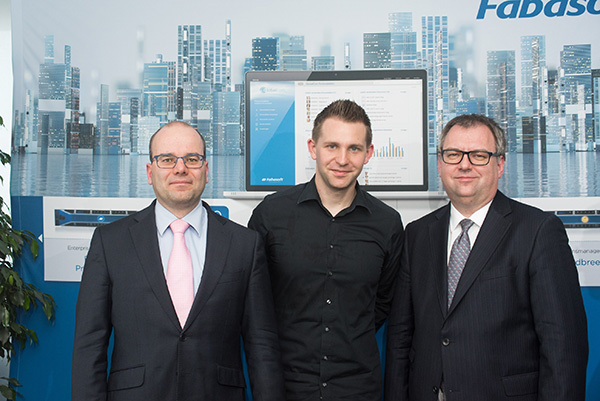 Vienna, April 28, 2016 – At Fabasoft’s well-attended TechSalon, the successful data protection activist and challenger of Facebook, Max Schrems, discussed the consequences of the new European data protection regulations on the economy together with lawyer Rainer Knyrim, partner at Preslmayr Rechtsanwälte, and Fabasoft CEO and host Helmut Fallmann. The panellists agreed that a lot of preparatory work was lying ahead of businesses before the new General Data Protection Regulation would come into effect in the spring of 2018. Owing to the worldwide desire for the respect of privacy, the experts were nevertheless regarding the strict European rules on data protection as a future competitive advantage for the European economy. Max Schrems compared the EU-US data protection agreement (“Privacy Shield”) to a “pig brushed up with a bit of lipstick”, without any legal value for data protection. In the end, the agreement would once again be taken to the European Court of Justice. More than 150 people attended the Fabasoft TechSalon, among them were Univ.-Prof. Reinhard Posch, Chief Information Officer of the Austrian Federal Government; Alois Bürger, EVN; Sophie Figlmüller, Dräger Austria; Judith Leschanz, A1; Rolf-Dieter Kargl, Research Institute (RI); Manfred Pecha, Siemens; Maria-Theresia Stadler, Österreichische Kontrollbank; Helmut Steiner, Frequentis; Martin Zeiner, Telekom Austria, as well as Leopold Bauernfeind, Fabasoft CEO.